The end of the month is always around the corner. For those not in the know, Mary Kay directors DO have quotas and must have total unit production of at least $4,500 per month. If they miss a month, that is okay but they must make the minimum the following month. (Two misses in a row, and you’re no longer a director.) So directors, is it your ‘off’ month? Meaning, did you miss production last month, so you HAVE to make it this month? HAVE to hit $4,500 or you will lose your directorship? In the past, that has meant that you pull out all the stops, like do a personal blitz where you warm chatter the free world and facial everyone you can, hoping to recruit one or some and bring them in with big inventory. Once in a while, that works. Or you run a big promotion with your unit. Never mind that your unit is minuscule and doesn’t produce to begin with, which is why you keep having low numbers. So you run the end-all be-all promotion, and maybe a few people participate, but it is never enough. What usually happens, though, is that you place the order yourself. Whatever is needed to get to the magic number of $4,500. Sometimes $800, sometimes $1,200, sometimes $2,000, I have even seen $3,700 before. Whatever the amount, it has nothing to do with what you sold. The amount you place is the amount needed to get to $4,500, period. You have spent thousands on these orders all in the name of keeping your title, keeping your unit. Here is some food for thought for those of you who find yourself yet again in this insane cycle of self-destruction. You bought into the “short-term sacrifice for long-term gain” thing, but how long are you going to sacrifice your family, your time with them, your financial future and security, your integrity? Have you been a Mary Kay director a while now? Hasn’t it been long enough? Is 5 years enough? 10 years?? Face reality that this will never change! Even if you’ve only been in a year, you’re conditioned to think it gets better, but it really doesn’t. If you are spending thousands of dollars on product you don’t need, then you are jeopardizing your family’s financial future, plain and simple. If you are lying to your husband then that is, well, lying. If he does know, I guarantee he hasn’t been happy about it. And with very few exceptions, directors do not make good money. Most make poverty level pay or below. Most, if not all, work insane hours. Think about it. How is your life balanced? How is this better for your family? Your children? Your relationships have suffered with all you care about. You do not make any money, and in short, you live a lie. Look at your 1099 from last year. Just look at it, and be honest with yourself. As far as helping other women, who in your unit is actually making good money? If you are a senior director, are any of your offspring making good money? Do you have any that are on the make production/miss production merry go round? If so, have you discussed this with them, or do you just silently collect your commissions? No matter what, your involvement is not enriching anyone’s life, be very clear about that. So these 2 reasons, while selfless, are in actuality just fluff and not real. They might have been your “why” in the beginning but if you will be honest with yourself, the REAL reason you put your loved ones in jeopardy and set your integrity aside every month to maintain an empty title is SELFISH PRIDE. I hope that there is someone out there struggling this month that will see this and make the positive, family focused decision to NOT PLACE THAT ORDER. Get over yourSELF and focus on what is right and what is real. Don’t place that fake order this month! You Can Run But You Can’t Hide From the Mary Kay Ladies! Truth! The sole reason I stayed a director as long as I did…limping along with a small unit- me working like a dog was sheer pride. I’m truly ashamed of this fact, but it is a fact. I was prideful for that darn suit. It’s crazy, but being recognition oriented- I worked hard for it, I wasn’t going to give it up without a huge fight. I struggled for 5 years of hit and miss production.. interestingly enough.. those same 5 years I did the court of sales… coincidence, I think not! I knew that my selling would make up for the shortfall of my unit, and I kept my status as a result. Until I finally had enough of the insanity and truly saw what I was doing to our finances and my family. I missed that dreaded 2nd month in a row.. and was dropped like a hot potato! I’ll admit- I cried a little…. because of all the work I had put in, but then a huge wave of relief hit me… I no longer had to fake it. I was free! It’s just so sad, isn’t it? THey tell you you’re not REALLY spending money because you’ll sell all that stuff and end up with a profit. Yet it goes unsold. 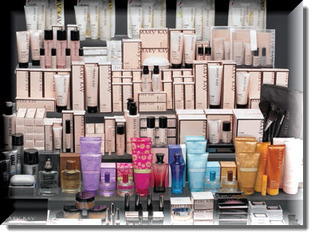 WOmen accumulate thousands of dollars of products over time and it all collects dust. Oh I know. It’s her fault if she doesn’t do the work to sell it!!! No. No, it’s not. Not when there is very little of a REAL retail market for these products. The lie is that consumers are spending millions on MK products. THe truth is that consultants are spending millions, but actual third party consumers are not. Oh, you hit the nail on this! Fear of being labeled a “quitter” and being aware of all I sacrificed to get where I was. Even having production requirements more than met, I still had the same feelings you did. You know who did NOT quit? The Donner Party. What did it get them? Mostly dead and partly eaten. The segment of the party that quit and took the other trail all survived. I wonder, would you have been so recognition oriented and prideful about MK if you had known it was an MLM/pyramid scheme? (I doubt that very much) And doesn’t MLM prey on those natural human needs and emotions? If only, IF ONLY people knew to just avoid all MLM including Mary Kay, none of these problems would be an issue. It is that easy, but it’s easier said than done because MLM is a con. A con must ‘appear’ legitimate or it wouldn’t be a con, but rather, blatant robbery. @Lurkers You are currently a prideful, selfish, money hungry pyramid schemer – by design. Is this who you want to be? If you are religious, is this who they teach you to be? And no, you are not helping other women. You are involving them in a con game and supporting its products for selfish reasons. Again, the best con is the one that can fool the most into thinking it’s legitimate. Are you currently one of the selfish fools helping to make it a good con? The people really trying to help you are the ones who have made the MLM/MK mistake in the past. Bless them for sharing their stories FOR FREE! They aren’t trying to sell you anything – like your recruiter is. Think about that. If you are encouraged to endless-chain recruit as a priority, you ARE a pyramid schemer. Smoke and Fire. You have been smelling smoke, and PinkTruth is showing you there is indeed fire. Not all bad things are preventable, however THIS is. You can simply choose not to be a pyramid schemer and escape the burning building. How fortunate is that! Or, do you stay like the devil and invite people into the fire to join you? I to live the same horrible reality of struggling to meet the production month after month!! It is very deceitful how Mary Kay does not inform you nor do you were future sister directors when you’re in DIQ inform you that once you become a director do you work harder than any consultant Everwood and for what for an ugly suit?? For a car that you have to make car payments on if you don’t meet your production and you have to pay the Mary Kay insurance on it which is often more than what you would normally pay on a car that you own … for a worthless piece of jewelry that for the same amount wholesale production i.e. $20,000 you could’ve had the most amazing piece of jewelry you ever saw …., When it was all said and done I sat back and looked at it and I was like this is what I was struggling for this is ridiculous and I am so grateful every day that I found pink truth !! The lead in picture gave me anxiety. Combine that with my former director texting me that she wants me to do a “New Year, New You Makeover.” Not going to happen. I didn’t even respond to the text. Think of all the products being ordered right now by consultants so they can “earn the all-expenses-paid MK cruise.” MK is making a boat-load (forgive me) of money from this gimmick. Consultants will rue the day they “earned” a four-night trip on a floating amusement park/food court. Just for some envy-baiting Facebook photos. When did the start the cruise? Is this a director herself or team? I thought directors mainly focus on recruiting and not buying, I mean, selling. Is this a director herself or team? The $4,500? Stephanie, the director ends up buying product every other month to meet her minimum production amount of $4500. This happens when the director has a small, weak unit who don’t do much buying of their own. The director then makes up the $$$ amount needed to keep their coveted (hah!) director status.